2 layer board of 1.11 x 0.68 inches (28.1 x 17.2 mm). Uploaded: February 8th, 2019 19:09. 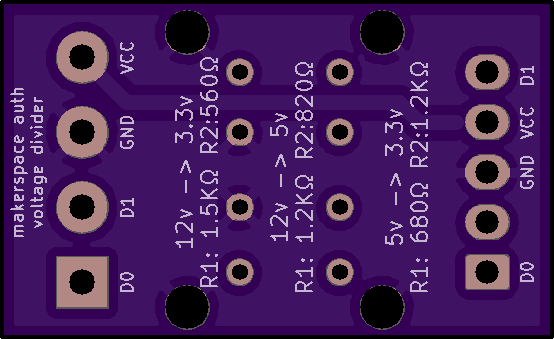 A breakout board to simplify the connectivity of a wiegand device to a molex KK connector for use with the makerspace auth board. Normally wiegand devices use 5v logic, this provides a non-technical user with an easy to assemble board with reference information for creating a voltage divider and connecting with a 3.81mm pitch terminal block. 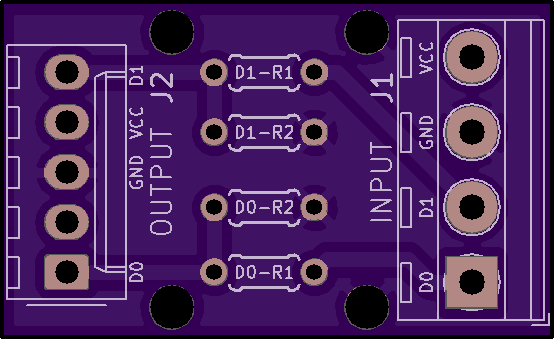 2 layer board of 0.71 x 2.11 inches (17.9 x 53.5 mm). Uploaded: October 3rd, 2017 05:06. 2 layer board of 0.91 x 2.21 inches (23.0 x 56.0 mm). Uploaded: September 20th, 2017 16:56.